Acctivate offers functionality to reset the workflow status to a specific workflow status on a sales order once a Sales Order has been processed in a certain manner. 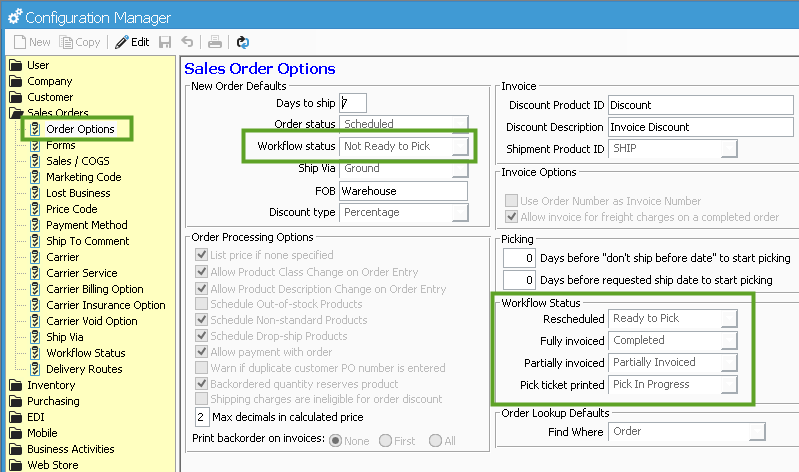 In Configuration Manager -> Sales Orders -> Order Options, you will find the Workflow Status section. Here, you can select which workflow status to use when certain processes have been run. Rescheduling a Sales Order that was currently in a Backordered status will set the workflow status on the order to the workflow status you select in this Rescheduled workflow status option. The Fully Invoiced workflow status will be set on the Sales Order when the order has been completed and fully invoiced. The default status selected here is typically ‘Completed’. The Partially Invoiced workflow status is used when a Sales Order is partially invoiced, meaning the Order Status is now set to ‘Backordered’ and lines are still open on the Sales Order. When pick tickets are printed for a Sales Order, Acctivate will set the Workflow Status to the status selected in the Pick ticket printed option.